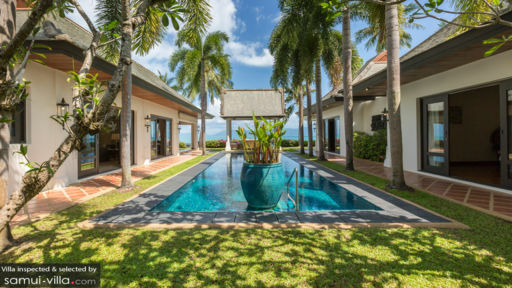 Located on the shores of Mae Nam beach, Villa Champak overlooks the beautiful panorama of Koh Pha Ngan. The five-bedroom holiday haven offers direct access to the beach and uninterrupted views of the ocean stretching out to meet the horizon. A beautiful sunset marks the evenings at the villa, for a mesmerizing experience wherein you can relish the tranquil surroundings taking your time to really enjoy nature’s bounty. 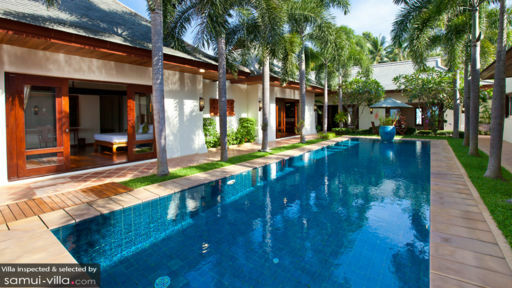 With quality services and traditional architecture, the villa is a perfect mix of modernity and old-world culture. There are five, air-conditioned bedrooms at Villa Champak and each is furnished to provide the utmost comfort. The master bedroom is furnished with a king-sized bed and features an en-suite bathroom with a sunken bathtub. The second bedroom is fitted with king-sized bed, then the third bedroom is fitted with a king sized and twin bed. The rooms open outwards to the gardens through glass doors which also offer pretty views each morning and night. The last two bedrooms are furnished with twin beds, making it more convenient for guests with larger parties. Each of these bedrooms has its own en-suite bathroom which comes fully-furnished with modern amenities. Fringed by towering palm trees, the beautiful 14-metre swimming pool is the most refreshing and classic timeout anyone could desire. As you float and splash around in the pool, feel all your worries seep away leaving you with nothing but positivity and an open mind. The pool offers a stunning vista of the ocean, and is a great spot for catching the sunset. Lounge on the sun chairs as you regain your strength after a lap around the pool and treat yourself to a chilled drink or two or a few! A traditional gazebo holds an outdoor sitting area with comfortable sofa and armchairs. The lavishly furnished living area is right beside the swimming pool which you can reach by sliding open the glass doors. There are cozy and comfy couches and armchairs inside facing a massive flat-screen TV as well as other sitting spaces for a nook or corner where you can rest and relax after a long day of walking around. The high-vaulted timber ceiling adds a traditional Thai ambiance to the entire space, which you get to enjoy to your heart’s content. A sound system is in place besides the TV, as is a DVD player for fun and endless movie nights! The villa offers both indoor and outdoor dining options to choose from. The outdoor dining is situated beside the pool and there are two indoor dining spots. One more formal dining area occupies an entire room and the other one is in the main living area. The kitchen is a western-style kitchen fitted with excellent appliances and fully-equipped to serve the guests. 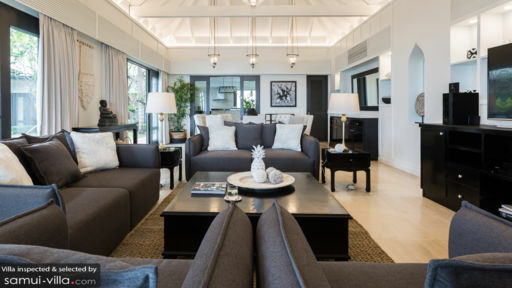 The staff includes a villa manager, housekeepers and maintenance who are there to ensure everything is running smoothly and that all your needs are met. They will also be serving a delicious breakfast each morning as a pick-me-up right before you start your great adventure. Being close to the beach has its many advantages, one of them being the ease with which you can head down to its sandy shores and play around in the water or sunbathe, swim, and surf. For a relaxing time, Bo Phut beach is the place to be as not many people frequent it and you can have your personal space.